Human beings use a suitable medium to share their feelings, emotions and experiences with others. Language is the best suited medium used for this. Language differs from place to place & person to person. Language is a broader term. However a sentence is used to convey the message. A group of jumbled words without any meaning does not form a sentence. Instead of going after nomenclature one should try to understand the basics or facts. It is therefore very essential to learn the formation of a sentence. 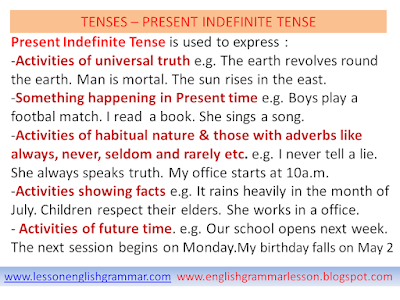 For formation of a sentence we make use of TENSES. 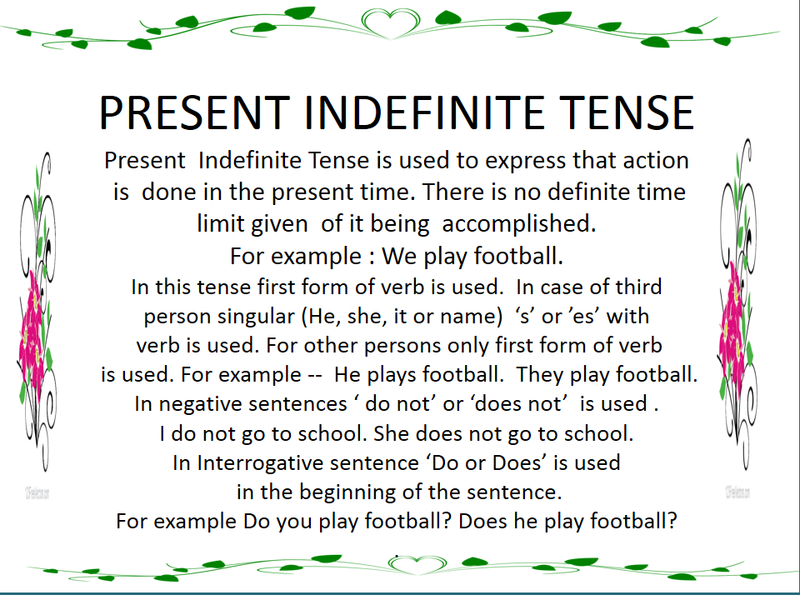 Tenses denote time when a particular work or action is accomplished. 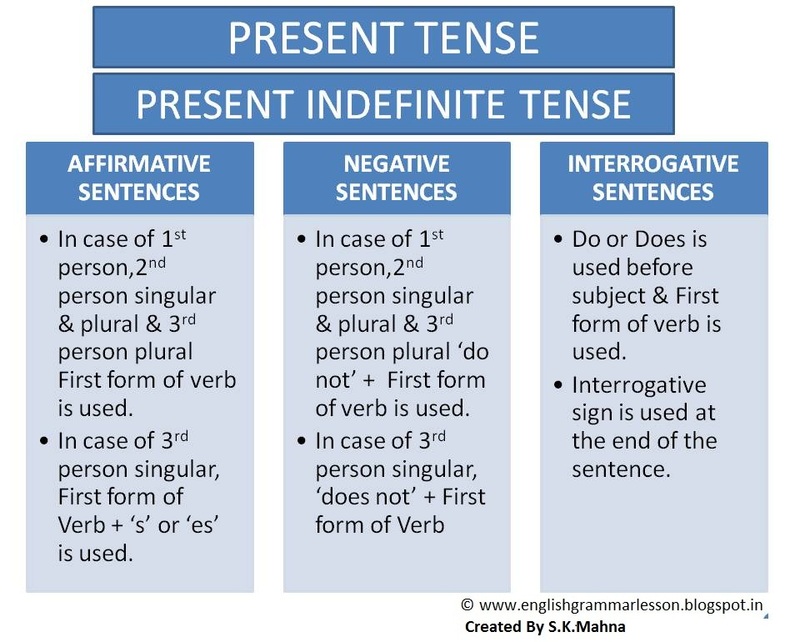 Tenses are of three types. It is used to show that a work is actually being done. In this formation of sentence time limit of action being done is not limited in specific terms. One is not sure about when action is being done and for how long action will be undertaken. For example : He writes a letter. This sentence shows that the subject undertakes a work in the present time i.e. He the subject writes a letter in the present time. But there is no definite time limit for how long action is done. 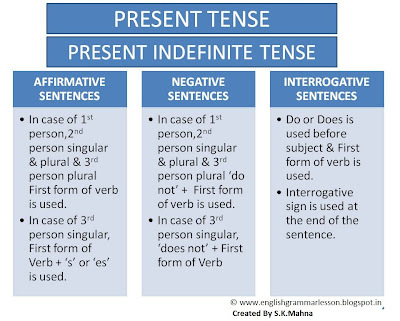 So this is called Present and not definite i.e. 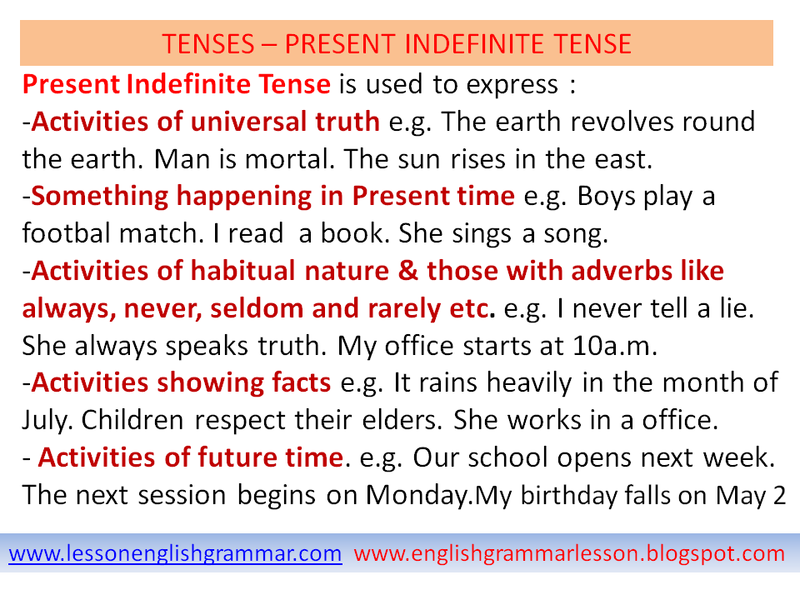 Indefinite Tense. In this tense we use first form of verb. In case of affirmative sentences with third person singular 's' or 'es' is used with verb. In case of first person singular and plural, second person singular and plural and third person plural forms only first form of verb is used. In case of negative sentences 'does not' is used with third person singular and in the remaining cases 'do not' is used. In case of interrogative sentences 'do' or does' is used in the beginning of the sentence and sign of interrogation is used at the end of the sentence. I sing a song. I do not sing a song. Do I sing a song? We sing a song. We do not sing a song. Do we sing a song ? You sing a song. You do not sing a song. Do you sing a song ? He sings a song. He does not sing a song. Does he sing a song? She sings a song. She does not sing a song. Does she sing a song ? They sing a song. They do not sing a song. Do they sing a song? For First Person singular & plural, Second person singular & plural and third person plural subjects – first form of verb is used. 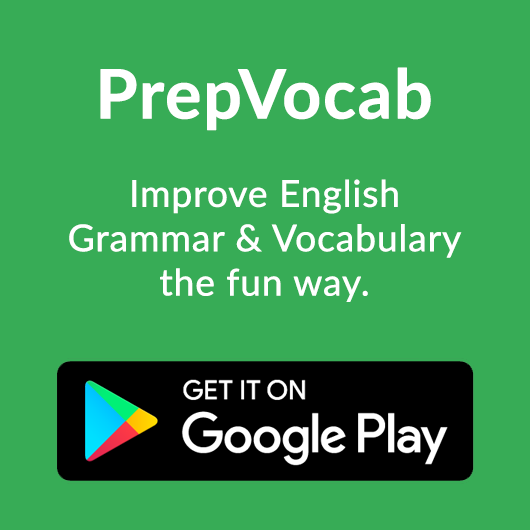 In all the sentences mentioned above first form of verb is used. 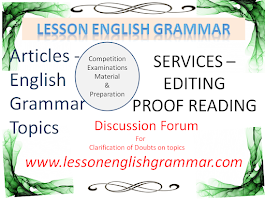 For third person singular subject – s or es is used with first form of verb. For example with He Or She or a noun i.e. any name (singular), s or es is used with first form of verb according to type and nature of verb. He goes to the school daily. 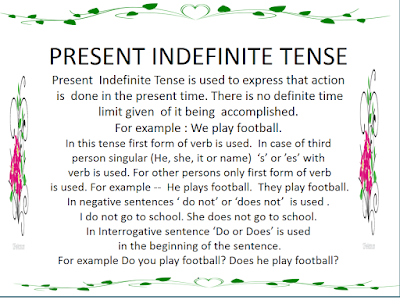 In negative sentences for First Person singular & plural, Second person singular & plural and third person plural subjects – Do not with first form of verb is used. I do not like sweets. We do not drink milk. You do not go to the office. Boys do not make a noise. For third person singular subject – s or es with verb Ist form of verb is deleted and does not is used with first form of verb. For example with He or She or a noun i.e. any name (singular), does not is used with first form of verb according to type and nature of verb. Mary does not play hockey. He does not recite a poem. This child does not cry. In Interrogative sentences for First Person singular & plural, Second person singular & plural and third person plural subjects – Do is used before subject and first form of verb is used. Interrogative sign is used at the end of the sentence. For third person singular Does is used before subject and not is used before verb first form. Does he go to the office? Do boys make a noise? In the interrogative negative sentences not is used before verb. Do you not read a book? Do we not help you? Does she not sing a song? In case of Interrogative sentences with words staring with 'wh' the sentence starts with the word of 'wh' followed by 'do or does'. The remaining sentence is written as other interrogative sentence is written. Why does she not like him? Which book do you read? Which book does she read? Whose shirt does he wear? When does he go to his office? Whom does the teacher teach? In case of some Interrogative sentences 'do or does' is not used. In case of sentences with 'Who' and 'What' 'do' or 'does' is not used. 1. The earth ................ (revolve) round the sun. 2. Borrowed clothes ................( not fit) well. 3. I ...............(remember) happy days spent with my friends. 4. We all ............. (love) our country. 5. The stars .............. (shine) in the sky at night. Convert following sentences into Negative sentences. 1. The young man always speaks the truth. 2. Children sleep early at night. 3. His mother tells him stories. 4. She goes out for a walk daily in the morning. 5. Bad habits grow soon. Convert following sentences into Interrogative sentences. 1. Those girls sing beautiful songs. 2. She paints a beautiful painting. 3. The gardener waters the plants daily. 4. It rains hard in the month of July. 5. Children do not finish their work. 1. What ........... (do/does) your brother eat now? 2. Where ............ she live now a days? 3. Why ........ you not listen to him carefully? 4. When ........... she get up in the morning? 5. When .......... he go to his office? I .............(know) a hermit who .............(live) in a small hut in a garden. He ...........(love) children very much. He ............. (allow) children to play in his garden. Children also .............(love) him very much. The hermit ............ (play) with children in the garden. He also ...............(distribute) sweets among the children. Children ............... (like) sweets very much. The hermit ...........(spend) his time with children happily. Children also.............( enjoy) themselves in the company of the hermit. People...............(believe) that God ...............(reside) in the hearts of noble persons. He always .............(bless) them with His choicest gifts who ...........(has) faith in Him and ..............(do) the right. God ............. (protect) them from evils. Those who ............(keep) their firm faith in God always ............ (succeed) and................(progress) in their life. In material world of today people ........ (hanker) after money and worldly affairs and.............. (do) not ...........(remember ) Him. This is the reason that people .............(suffer) in their life. Exercise..............(keep) a man fit and healthy. If a man .......... (take) exercise daily he ............ (possess) a sound body and a sound mind. People .......... (take) different types of exercises to ...........(keep) themselves fit and healthy. Some people .............(take) hard and tough exercises but elderly people generally ..........(use) light methods of exercise to ........(keep) themselves fit. Mostly they ..........(go) out for a stroll in the morning and evening. This ........(keep) their body active for the whole day. They also ............(prefer) to.......... (take) light food. Light but nutritious food ........... (give) strength to the body. Fill in the blanks using appropriate form of given verb in Present Continuous Tense. He........... (like) to play hockey. He ........... (want) to become a National champion of the game. He .............. (go) to the play ground and ...............(do) practice of the game daily. His coach .............(impart) training of playing hockey to him. He ..................(take) keen interest in playing hockey. Besides this he.............. (study) ardently. He ................(want) to become proficient in all fields. 1. The earth revolves round the sun. 2. Borrowed clothes do not fit well. 3. I remember happy days spent with my friends. 4. We all love our country. 5. The stars shine in the sky at night. 1. Do you love your country? 2. Does he not eat an apple? 3. Do they take exercise in the morning ? 4. Do we not respect them? 5. Does the sun not set in the west ? 1. The young man never speaks the truth. 2. Children do not sleep early at night. 3. His mother does not tell him stories. 4. She does not go out for a walk daily in the morning. 5. Bad habits do not grow soon. 1. Do those girls sing beautiful songs? 2. Does she paint a beautiful painting? 3. Does the gardener water the plants daily? 5. Do children do finish their work? 1. What does your brother eat now? 2. Where does she live now a days? 3. Why do you not listen to him carefully? 4. When does she get up in the morning? 5. When does he go to his office? I know a hermit who lives in a small hut in a garden. He loves children very much. He allows children to play in his garden. Children also love him very much. The hermit plays with children in the garden. He also distributes sweets among the children. Children like sweets very much. The hermit spends his time with children happily. Children also enjoy themselves in the company of the hermit. People believe that God resides in the hearts of noble persons. He always blesses them with His choicest gifts who have faith in Him and do the right. God protects them from evils. Those who keep their firm faith in God always succeed and progress in their life. In material world of today people hanker after money and worldly affairs and do not remember Him. This is the reason that people suffer in their life. Exercise keeps a man fit and healthy. If a man takes exercise daily he possesses a sound body and a sound mind. People take different types of exercises to keep themselves fit and healthy. Some people take hard and tough exercises but elderly people generally use light methods of exercise to keep themselves fit. Mostly they go out for a stroll in the morning and evening. This keeps their body active for the whole day. They also prefer to take light food. Light but nutritious food gives strength to the body. He likes to play hockey. He wants to become a National champion of the game. He goes to the play ground and does practice of the game daily. His coach imparts training of playing hockey to him. He takes keen interest in playing hockey. Besides this he studies ardently. He wants to become proficient in all fields. Hi Surinder Mahna, you have worked so amazing by preparing a great blog on English grammar learning. I am glad that i found this post through my friend. I also go thought by all your post and would like to share this website link with my students.Hope they will also get some help to learn English in a better way. Keep Updating with latest English related content.